On 22nd January our first workshop was held at Sandylands Methodist Church, in the heart of one of the most densely populated areas to be affected by Kendals flood. Sandylands strength of community spirit made the local news so it seemed fitting to start the project there. 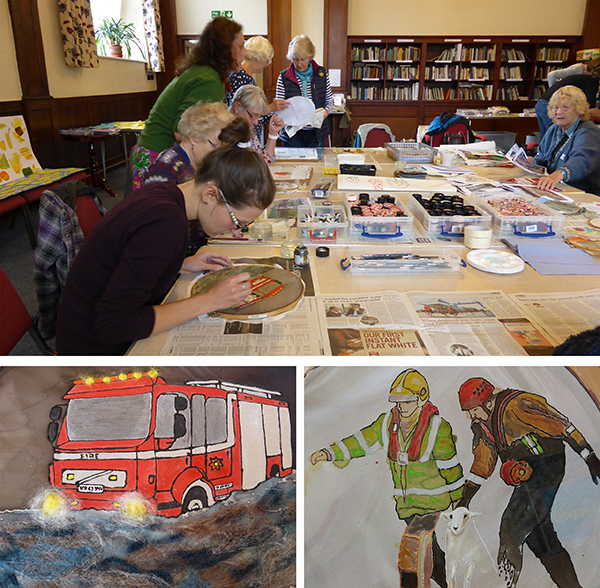 Attendees were informed what the flood tapestry project was all about, then shown a short introductory film about the Quaker Tapestry community project to inspire them. It was explained from the start that no one was expected to be artists or skilled sewers. This was simply a way of sharing good human stories to interpret onto a wall hanging, to let go of their inhibitions and let others know their memories of that devastating Saturday night. 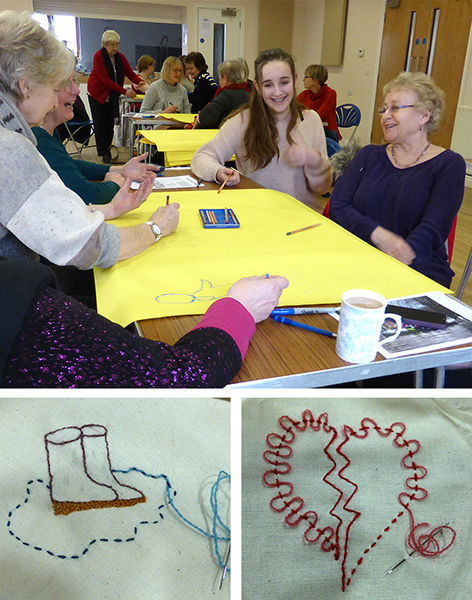 Artist Catherine MacDiarmid ran a very informal and fun session with drawing, writing and some stitching (from some first time stitchers) interspersed with tea and cake. There was lots of encouragement and help to enable everyone to contribute regardless of their crafting or artistic ability. 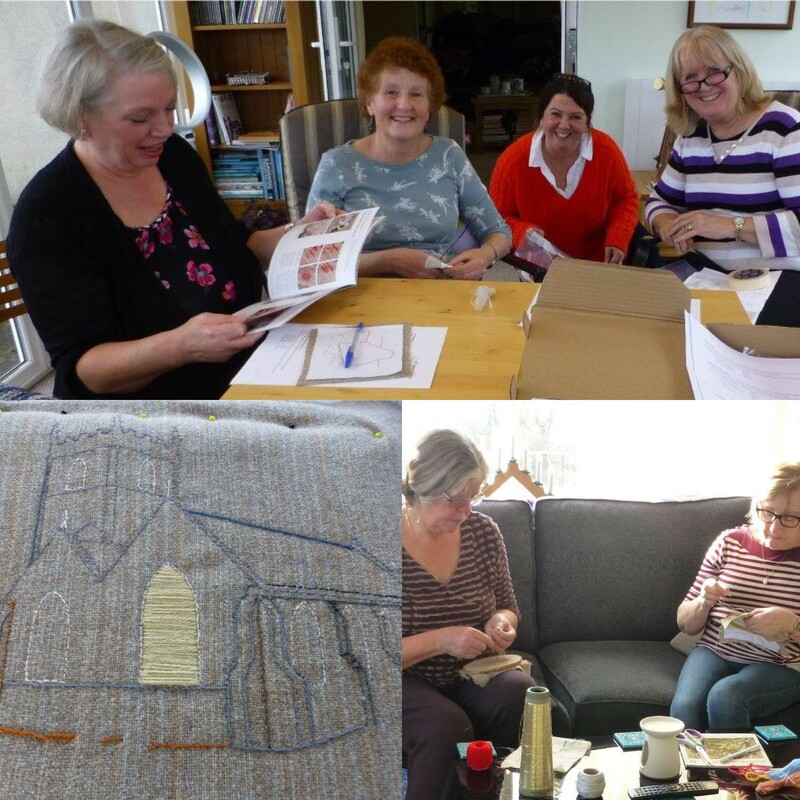 It was a hopeful, uplifting and rewarding experience showing anyone can get involved, not just those who can stitch and create. At the end of the project all the individual components will be brought together by Donna Campbell and a small band of volunteers to make a wall hanging. Its home will be here at the Quaker Tapestry Museum in Kendal but, like the 77 embroideries already housed there, it will travel to other venues. We would love to hear from anyone who would like to take part in workshops which we will take to groups, schools and community centres. It would also be wonderful to hear from anyone who can help us record the stories and workshops for an accompanying audio guide and film. What next? We hope the interest will grow as the project progresses. We know that there are some schools and other community groups interested in taking part so we shall be organizing more workshops and collecting stories and ideas to take forward towards the final design.